Tell me about the team behind the site. There are three of us at the moment – our MD Ray Mason, who came up with the concept of Travel.co.uk, has previously taken charge of OctopusTravel, and also worked as a consultant for Virgin Holidays, before becoming MD of Teletext Holidays. Our head of customer experience Mike Ramsden worked on the design and development of their websites for Thomas Cook Interactive before working for Comtec, a software provider for the travel industry. My background is also in online travel, I have worked for Crystal Holidays, Virgin Holidays and Teletext Travel before joining Travel.co.uk. 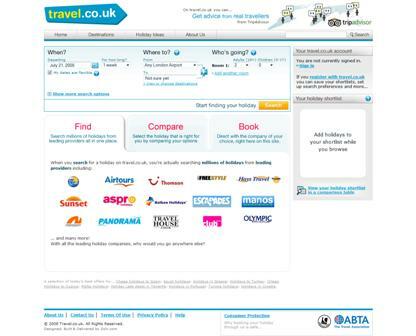 How does Travel.co.uk differ from other holiday comparison sites? We were aware of some of the drawbacks of other comparison sites in the travel industry, and have tried to avoid these mistakes. Most other sites will send customers direct to the travel agents’ or tour operators’ site to complete the booking, and often customers will find that a deal is out of date or that the price has changed once they get there. This is because most sites work from a daily feed provided by the travel agents, and these can be out of date very quickly. We take a different approach by linking directly into travel operators’ reservations systems, which gives our users the very latest information on availability and prices and should avoid some of the drawbacks of other comparison sites. We act as an interface for agents and tour operators, so users remain on our website to complete the booking process. What have you done to improve the user experience on the site? We have tried to make the user experience better than other travel sites, and the search tools are a vital part of this. Users can search for prices and have the results displayed on a calendar, which helps them decide on dates, while a graph below shows which dates are cheapest. If users prefer, they can view the results as a list. We wanted to avoid common errors, such as allowing people to search for invalid flights, so users don’t get ‘no results found’ when they enter a destination. We have also provided some useful tools for users to compare holidays. They can shortlist holidays they find on searches and compare the results side by side in a table. This includes information such as average temperatures and rainfall for the time of year, to help them decide. We have also integrated reviews from TripAdvisor into our holiday search results, and aim to give customers plenty of information to help them decide on a holiday. A recent Google study said that people searching for holidays look at an average of 22 sites before they book – we aim to be one of the top sites that people come to when looking for a holiday online. How many travel agents and tour operators are on board? We have twenty agents and operators on board at the moment, including most of the major travel firms. We have Thomson, Airtours, Thomas Cook and others, while we hope to add Virgin Holidays shortly. We also want to include as many independent operators as we can. We also allow users to book with personal travel agents, who are manly home workers who fall under umbrella brands. Travel.co.uk is financed by a number of private investors with experience of the travel industry. How are you marketing the site? This is mainly online, through SEO and paid search. We have had a skeleton site with some content online for the past six months to build up our rankings; we are on the first page of Google for a number of important search terms. We hired Zolv for the project, a company that has previously worked on other travel websites, including Virgin and Teletext Holidays. What developments are planned next for the website? We are only displaying package holidays at the moment, which constitutes the lion’s share of the holiday market, but we are planning to integrate flights and accommodation in the next few months. We will show results for flights and accommodation (dynamic packages) alongside standard package holidays so users can see whether or not they can save money by booking flights and accommodation from separate travel agents. Having recently ended its partnership with Amazon and launched a new e-commerce site in the US, I expected that Borders would develop a similar version for the UK. However, the redesigned Borders.co.uk has now gone live and it is completely different to its US counterpart. This week, we speak to Chris Smith, online marketing manager at Autoglass, about the company’s bid to boost customer acquisition through a new .mobi site. We ask about the pluses and minuses of mobile development and which mobile channels are best for generating ROI.